Be amazed at the intricacy of one of the oldest porcelain manufactories in Europe at the MAK. The arts and crafts Museum of applied arts, Vienna or The MAK as it is also known, has produced an exhibition surrounding one of the oldest porcelain manufactories in Europe. The products and designs of the Viennese manufactory carved out new standards throughout history and visitors to the museum now have the opportunity to view these productions. The exhibition which is open until September 23rd offers an incredibly extensive array of objects, over 1000, from the museum itself to national and international pieces consisting of pattern books, original drawings and colour trials to name just a few. Visitors will be left in awe at the extent in which porcelain was applied, not just as ceramics but entire rooms and clock cases helping to build real appreciation for this artwork. From the foundations laid by Asian predecessors to the Europeans who eventually found the secret of porcelain production, the Vienna Porcelain Manufactory dates back to an extraordinary 1718. Many visitors may not realise where porcelain began its journey, but this display ensures that they will be taken through time so that they leave with a thorough understanding of its history. The exhibition is laid out in five separate sections which reflect significant periods that define research into the historical development of the manufactory, providing a step by step and simplistic guide for visitors to truly understand its past. Designs by artists and architects from the Vienna academy are also shown allowing for a detailed look into the developments of the manufactory. The exhibition programme is wide-ranging offering regular tours to interactive activities for children, families and individuals alike, allowing for a variety of people to discover and appreciate the work that has gone in to these pieces. The exhibition also offers a look into the latest research findings of unpublished documents on some of the key works by the Vienna Porcelain Manufactory. Visitors are also able to benefit from the publication of 300 Years of the Vienna Porcelain Manufactory; this exhibition offers an abundance of information and interactive activities to keep individuals engaged and will be undoubtably worth the visit. Allow our app to guide you through history and explore the beautiful features of these pieces, available in English and German. Download today! What do smoke grenades, chicken feathers, cotton bolts and matchboxes have in common? They are all part of Cinthia Marcelle’s latest installation at the Modern Art Oxford, one of the UK’smost cutting-edge art space for international modern and contemporary visual art. Cinthia, arguably one Brazil’s notable contemporary artists, developed her installation Family in Disorder specifically for the upcoming exhibition in Oxford. Inspired by social inequality around the world, Marcelle sought to produce a mirroring image of chaos and order by taking advantage of the architectural features at Modern Oxford: she placed identical black carpets in the museum’s Piper Gallery, where the carpet covered the entire floorspace, and the Upper Gallery, where the carpet failed to reach the perimeter of the room. Marcelle stacked the materials in the Piper Gallery in perfect order, spanning the entire width of the carpet and producing an image of structure with an impassable obstacle. She left the Upper Gallery’s installation to a group of six artists, providing them with the same amount of materials, giving them the freedom to build, dismantle and rebuild new structures. The resulting disorder of the artistic exchange in the Upper Gallery leaves a sense of impurity and confrontation. Marcelle’s installation is a response to the ongoing social inequality experienced around the globe, from her home country of Brazil to Oxford. The dismantling of structures within the Upper Gallery presents the efforts made in protests and movements to promote liberal values against patriarchal structures featured in the Piper Gallery. The exhibition is presented alongside the premiere of her video Truth or Dare, taken during Marcelle’s residency in South Africa. Animated from photographs of a concrete triangle, the triangle presents a compass trying to find its magnetic field and failing to do so until met with a human shadow. It encompasses her message of confluence of our bodies, industrial objects and the environment. CloudGuide is excited to present the Family in Disorder and Truth or Dare guides, available now on our App. The exciting installation, commissioned specifically for Modern Art Oxford, is on display until May 27! Nestled on the western side of the alluring Retiro Park in the royal city of Madrid, TheMuseo Nacional de Artes Decorativas is one of the capital’soldest museums with a vast collection of more than40,000 works of art. CloudGuide is excited to bring you the guide to the museum’s intriguing temporary exhibition,The Journey of Time: Craftsmanship and Korean contemporary design. To capture the consciousness of time, the Museo Nacional de Artes Decorativas invites you ona journey through Korean craftsmanship and contemporary design. The exhibition takes us from the creation of an object in Nature through its integration into the life of mankind, to finally taking shape in the work of art. In order to comprehend the harmony of Korean objects and their symbolism, it is essential to witness the balance between their beauty and usefulness. The exhibition focuses on the values ​​of contemporary design and thecultural legacy handed down from generation to generation, building into the preservation of tradition. The links between tradition and modernity in contemporary Korean culture and its unique philosophy of life are presented through distinctive sections of Nature, Man and Object. The Iines used to portray nature replicate traditional forms and techniques and their inspirations emerge from Korean intangible heritage. In order to provide the object with both functionality and beauty, it is essential to comprehend the properties of the materials and have the wisdom of handling those materials and tools in order to integrate them with the most sophisticated techniques of the era. From the creation of an object in nature to its integration into the life of man, objects can either go through complex processes or require minimal interventions. The objects arising from one of these treatments convey the warmth of time and the emotional passion of the artist. The Museo Nacional de Artes Decorativas is hosting The journey of Time: Craftsmanship and Korean contemporary design until June 24. Discover the inspirational world of Korean heritage and design now on our App! CloudGuide is proud to welcome the Thyssen-Bornemisza Museum to the CloudGuide app! 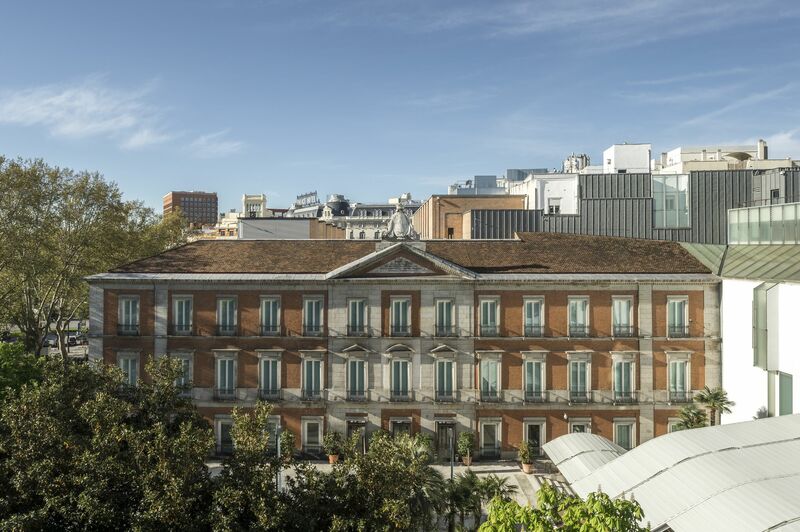 CloudGuide is proud to introduce you to the latest addition to our app, the incredibleMuseo Nacional Thyssen-Bornemisza, situated on Madrid’s bustling Paseo del Prado Boulevard! The prestigious institution is home to one of the most prominent private collections of paintings of the twentieth century. Featuring masterpieces by Rubens, Rembrandt, Manet, Renoir, Van Gogh, Picasso and other masters of painting, the museum’s established showcase is a delight for visitors to revel in. The fascinating assembly unveils some of the most prominent works of western art, spanning from the thirteenth century to the twentieth century. With almost one thousand works on display nestled in the historic Villahermosa Palace, visitors can relish in the Renaissance, discoverMannerism, pause in theBaroque, linger through Rococo and follow the path of Romanticism to finally behold thenineteenth and twentieth century art movements. The museum has always been highly appreciated for its awareness of Impressionism, Fauvism, and nineteenth century American painting as these works could rarely be found in state-owned collections. The Thyssen-Bornemisza collection, together with its principal creators Baron Heinrich and his son Hans Heinrich, found home in Italy during the turbulent politics of interwar Europe. When in 1992, Hans Heinrich decided to transfer his vast collection from the crowded gallery of Villa Favorita in Lugano, it marked the largest move of works of art in history. The new museum, nestled in the historic Villahermosa Palace wasinaugurated in 1992by the King and Queen of Spain. Following the huge success of the museum only a year after its opening, more than 775 works of art had been acquired by the Spanish public. Watch the history of western art unfold at the world-renowned Museo Nacional Thyssen-Bornemisza. For an exclusive glimpse at the highlights of their collection, download the guide on our App! Discover the magnificent diversity of the Americas. The Museum of America’s vast permanent exhibition, is definitely a treat for all archeology enthusiasts! Situated in the vibrant city of Madrid, Spain, the museum features extensive collections of American archeology and ethnology, ranging from the Paleolithic period to the present day. Arranged into five key areas, the permanent showcase first introduces its visitors to the history of the North American continent, followed by the inhabitation process, the formation of diverse societies, their relationships with the supernatural and ultimately the communication systems that have developed over time. The permanent collection, featuring 25.000 objects on display, aims to unveil the complex American reality using anthropological approaches. It takes its visitors on a journey through American history, starting with Knowing about America, the first area of the museum which delves into the way Europeans imagined the Americas before setting out on their quests in search of new territories. It wasn’t until the conquerors brought plants, animals and natives back to European monarchs that the image of the Americas changed in European minds. With a new understanding of the American reality, visitors are shown a wide array of conquests over the continent’s geographical features; showcasing encounters with significant American cultures and the flow of migration waves across land. Entering the largest area of the museum, The area of Society, visitors are introduced to the diverse cultures that lived in America for thousands of years. It illustrates the distinctive societies that have coexisted on the continent by demonstrating their day to day lives, opening the door to The area of Religion which teaches us that understanding a culture means understanding its religion. The hispanic catholicism fused with ancient practices and rituals creating a unique set of beliefs on the continent. Lastly, the area of Communication shows the origins of written communication in America and its development into an area of great language diversity. Highlights from the permanent collection of the Museum of America is now available on our app, featuring more information and content on the history of the Americas. If you’re in Madrid, make sure to add this exciting exhibition to your schedule, we promise you won’t regret it!